Gravel pit styled Control Point map. All timers, walk distances match GP's - a few seconds. All 'fighting areas' very close in size to GP's. Spawn times are somewhere around half. Main difference is C is inside a building, possibly easier to defend. To counter this once A and B are capped Blu gets a shortcut through the C gate that cuts run time in half compared to GP (instead of going through A or B you go straight to C). I'll have to try that, would have to have a server going though eh? I'll have to get back to getting that stuff going, been along time, forgot all the details. Anyway, the main issues were sight lines and overall size. I based it pretty roughly on GravelPit but was a little sloppy on measurements. So I went back and examined it a little closer before I made major changes, I had gotta quite a bit larger on my layout , probably 25%. So changes are pretty major and I'm going to completely redo A. Nobody really seemed to like it much and in my 2 tests it just wasn't a very fun area for me either. First, it moved towards B about the entire size of the area (about 1024 units), I'll surround it with buildings to block those sight lines (though they are about half of what they were now too). Everyone in both tests seemed to like B quite a bit, lots of compliments/no complaints (or major ones at least). So it's gonna stay the same, but it did shift towards map center about 256 units. Also added an alternate path from spawn into the blue buildings to B. I'll probably adjust those slightly. Didn't really hear complaints about C, but before the test I had already made some changes. I made the cap area a bit roomier by moving rocket back towards spawn. I think it'll be better for combat. The hallways on either side of rocket are gone and paths are simplified there some. Added another staircase outside red spawn up so red doesn't have to travel as far to get on balcony above C.
Also added some 'buffer room' outside red spawn doors so blu can't get quite as close. Going to move red spawn a bit closer to C also. With those changes I'm very close in size to Gravel Pit now and it should feel quite a bit smaller. Here's a pic that illustrates the changes. Hey sorry I haven't uploaded the screenshots I promised you (two days ago, was it? ), I've got them sitting on my other computer and I'll try to upload them later today. I've just been to lazy to look up the thread. Heads up though, I searched cp_original and all I got was a gameday thread and I found this from there, so perhaps consider changing the thread name to "cp_original" so people can find it easily? All the glaring issues have been fixed, hopefully now it's just fine tuning. If anyone wants to take a look I'd appreciate it. Will try to get it up next gameday and it should be up in rotation at Calculated Chaos soon. Don't see a way to edit the thread name though. Think I'm getting very close to final layout. Alright, sorry I didn't post the pictures I guess they'd be obsolete by now. Good luck with the final layout, let's test it! But that's all fairly non-important alpha stuff. Right now it's about making sure people find their ways, points are defendable or not, how timing works out. Like the doors. They will all be custom models once I get to detailing. Same with doorways, I'll be measuring up Valve doors...using similar scale. The trenches will have water. Kindof hated to not have it now as it effects pyros, getting out of the trenches, etc... But once I displace all that ground for Beta, then I have to rebuild all the water... so I skipped it for now. I know the stickies in air are kind of lame, but last time people complained about demos spamming spawn and told me to use bullet block... Trying to get away from the GPit tunnels from Blue spawn, so it's a compromise, air stickies. The windows above A are meant more as sniper zones, but they happened to be just big enough for a player to squeeze through, confusing people to whether or not they are supposed to be use able. My bad. If I made them use able Blu would get an extra couple seconds on A (though at the cost of fall damage). I think I prefer them sniper only. I'll give a more in depth look at spawn times. But as is they are like Valve's set-up, you don't get insta-respawn during set-up. And I'm pretty sure times are very close to GP, though my set-up is from Boojams pack, so they might not be exact. As far as map scale. times from spawn to points (shortest route) (and point to point) are the EXACT time as GP for pyros. EXACTLY. I timed by the clock several times. The only difference is that the gate to C opens (after A/B cap), giving Blu a 10-15 second advantage on C. Was done to mix it up a little, but also to help with the fact that C is more indoors and probably easier to defend than GPit C (which in it's own right can be a pretty tough point to cap). Also, the fighting areas (the switch backs on A to the Docks, including the inside of the building on A), the entire open area of B, and the area in front of C PLUS the inside area of the point on C are all equal in size to GPit's areas. (I made cubes in the spaces and imported them into my map. The tunnel areas are larger possibly, but fill in the same world space between points. Just more wiggle room inside them. Some props and downsizing will close them in more. I found it funny that one person said it's huge, then 10 people join in, and it becomes Gravel 'Canyon'. lol. Then someone stated Red has to walk 2 feet and Blu has to walk 2 miles... It's the SAME DISTANCE! I'm honestly glad I wasn't there, much easier to laugh about it, watch it as an unfolding scene in a movie, then try to play/and or explain. Just stand back and see what happens. After that useful wall of text, have a sentence: have you tried func_brushing the blockbullets brush above the BLU spawn doors? That'd make stickies bounce off. Then again, why not just use a skybox brush there? No, I'll look into it though. Rather have the stickies bounce than stick. Don't want to use skybox, the area should be sealed when I'm done and that would clip the rooftops from rendering. Looked into the timings for caps and spawns. They are exactly the same as GP and FC. 105 seconds to cap A & B for pyro. about 30 seconds on C, kindof dazed off by the time I counted that one though. That's actually built into the gamesys also. While you can change the times for capped points, I couldn't even see a way to change the game logic for spawn times or cap times. I actually think it's pretty good too, GP is a team based mode. You need the team to attack together and get on the point all at once for a fast cap. I think the map spreads the players too much, it is hard to make a proper push when everyone is scattered around. C also seems to be too hard to defend. Finding it difficult to get much feedback in the way of game play. But very little in the way of actual game play comments. That's what mappers really need during alpha. Mr Late has a few good points there and I'm working on some major changes to address that, Supersandvich also made some game day comments regarding the C area. That stuff is really appreciated. I plan on making the red spawn to C path just a high (balcony) and low entrance to C for Red, with a one way door heading to A. That'll keep red and blu from fighting on the way to C, it'll also make it harder for Blu to flank the sentry position above C (which made it hard for me to get a sentry up when a scout came in behind me). 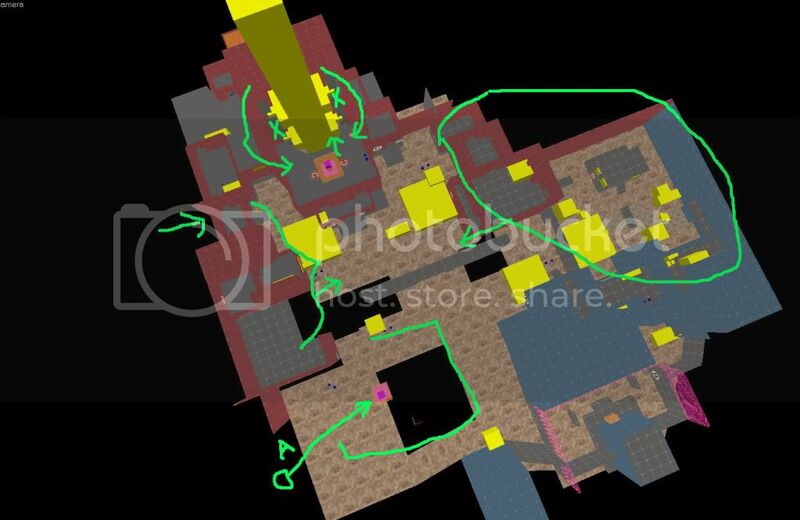 Spies will be able to access that balcony from a stairway that red uses from the spawn area (I have a good layout in mind so spies should be able to sneak in/uncloak/use balcony. This will also limit Blu from easy spawn camp access (another issue I have seen). It's also going to give red a slightly shorter spawn to C time. B seems hard to keep a sentry up for defense so I think I'm going to make a small (cave) platform behind it with good cover for a sentry. It'll have a ramp up from inside the cave. It'll add very little overall space to that area but I think it'll be a good defensive position. A cap point has already had the windows/room removed by the switchbacks. This will stop red from getting flanked. So A should be easier to defend. I think the C gate/wall/switch backs are going to be pushed closer to A. It'll give a little more breathing room in front of C building front door and it'll shrink the A area a bit. It'll also shrink the Blu spawn>switchbacks>A path some. After those changes are tested I'll look into how much the Blu/spawn area actually needs changed. And is Red still has a hard time defending C I'll look into not having the C gate open. This map was pretty fun. Some areas seemed large but then you also don't have detail that would break sight lines up and occupy more space. My main issue was that B was sometimes cumbersome, the fence props had strange collision meshes and it was at a strange height in conjuction with other level of height in the surrounding area (it was almost always flat low ground). Did some massive work yesterday and after final compile found 2 things I missed so new version will be out soon. B got some massive changes. Someone during gameplay said the water was annoying. The canal did run through the entire play area and I figured running forward and jumping over was fine, but if you're back pedaling and fall in it could be annoying. So now it runs under B and to right of B and behind is now a lake. All ground in front of B is open ground. Makes it more of a frontal attack for blu instead of a round-a-bout. changed the elevation change B>A path, made the inside flat, put the elevation change outside so B has some height variation. Blu spawn>B, added deck outside door instead of ramp at door. (again, some height variation in the outside area. Made cave behind B with plank to B for engies to have sentry spot. Also makes it easier for red to come into the back of B (inside cave system) instead of from side. Red Spawn, shifted sideways (towards B). right hand goes to C or stairway to balcony above C.
Also one way door towards A. Got rid of buildings between C and staircase to A. Much cleaner less confusing paths. Moved C gate wall/switchbacks forward a few units. Shrinks Blu area/Blu spawn path to A some. Gives more room to fight in front of C building (with changes in A>C path, combat should focus there more now). Also shrinks the ground are outside A some. Makes A>B path a bit cleaner. Added 'doorways' to A building doors. tightens up A point a bit, should make it less spammy through the doors. a12, changed the path C>A a bit. Around back of point is more open/outside instead of skinny tunnel. You have some neat detailing on this map so far, good work on that.